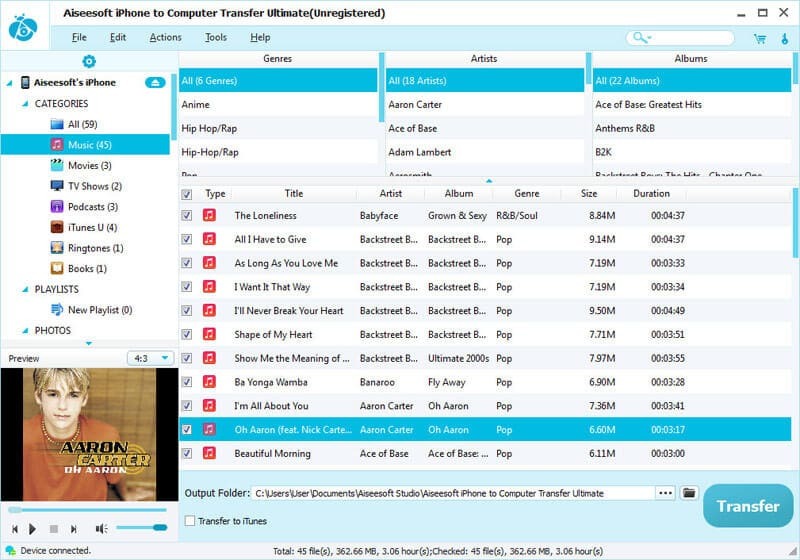 Aiseesoft iPhone to Computer Transfer Ultimate is specially designed to backup all iPhone files, including music, movies, TV shows, podcast, iTunes U, ringtones, ePub, PDF, audio books, camera roll, pictures, voice memos, SMS(MMS), contacts, and camera shot to computer without any loss. What's more, it supports The latest iPhone 5s/5c, iPad mini 2, iPad Air, etc. Key Functions: 1. Backup all files on iPhone to computer Aiseesoft iPhone to Computer Transfer can help iPhone users backup all iPhone files, including music, movies, TV shows, podcast, iTunes U, ringtones, ePub, PDF, audio books, camera roll, picture, voice memos, and camera shot, to computer or iTunes with zero loss. 2. Transfer/Backup iPhone SMS(MMS) and Contacts iPhone users can transfer the specific SMS/Contacts, all SMS of a specific Contact, or all SMS/Contacts on iPhone to Computer. Also users can backup the iPhone SMS and Contacts to this program, edit or delete the SMS/Contact informations. 3. All iPhone/iPad/iPod devices supported This iPhone Transfer is highly compatible with the latest version of iPhone, iPad and iPod. 4. Preview iPhone video or photo files The built-in player of Aiseesoft iPhone to Computer Transfer allows users to preview the iPhone video and photo effect. 5. Show all iPhone informations Once you connect your iPhone to computer, this iPhone transfer will show you all iPhone info, including picture, type, capacity(used and available space), version number, serial number, and format. Video Snapshot Wizard is an easy-to-use utility that allows to capture a series of frames from a movie. The software provides support for the most popular video format such as AVI, FLV, ASF, MOV, RM, RMVB, WMV, MKV, VOB, MPG, MPEG etc. iTransPod is a perfect companion for iTunes. It lets you import Movies, DVDs, YouTube Clips, Music Videos, Audio Books, Album Artwork to your iPhone, iPad, iPod Classic, iPod Nano, iPod Shuffle & iPod Touch. This plug-in appears inside iTunes. Enolsoft YouTube Converter HD for Mac is an all-in-one Mac YouTube HD video Downloader and Converter, designed for Mac users to easily download and convert YouTube FLV videos(especially YouTube HD videos) to many other video formats on Mac. Subtitulos is a simple program that will find spanish subtitles for your movies. All you need to do is right click on the movie choose menu "Busqueda de Subtitulos" and them click. Your web browser will open up displaying a perfect set of subtitles. Enolsoft Video to iPad Converter is the best iPad converting tool, helps to convert any videos like AVI, WMV, MKV, AVCHD, FLV, MOV, etc. to iPad supported video and audio formats, allows you to playback any videos on iPad for enjoy on the go! The video editing software allows you to edit video files in various formats like AVI, MPEG, H.264, SWF, MOV, WMV, etc. for playback on popular devices like iPod, iPhone, PSP, PS3, and so on. Gilisoft Video Splitter is a powerful video tool to split a large AVI, MPEG, RM, ASF, WMV, 3GP, MKV, FLV or MP4 Video file into smaller video clips without re-encode. Aplus DivX to mpeg Converter - Convert DivX Video to mpeg ( vcd standard format )File. iJoysoft Video Converter Platinum for Mac is a fast, powerful yet easy video converter to convert amongst video formats, extract audios/pictures from videos, convert audio files, and create video from pictures on Mac. Enolsoft Video Converter is all-in-one video converting program, helps users to convert between any video formats like AVI, WMV, MKV, AVCHD, FLV, MOV, etc., allows you to playback any videos on many portable devices like iPad, iPhone, iPod, PSP, etc. This site does not contain serial number, crack, keygen Aiseesoft iPhone to Computer Ultimate serial number : serial number is the simplest type of crack. A serial number(cdkey,product key,etc) is register the program as you may already know. a crack or keygen may contain harmful software. If you cannot find the exact version you want, just give it a try. for more information read .nfo/.txt/.diz file include in zipped file.